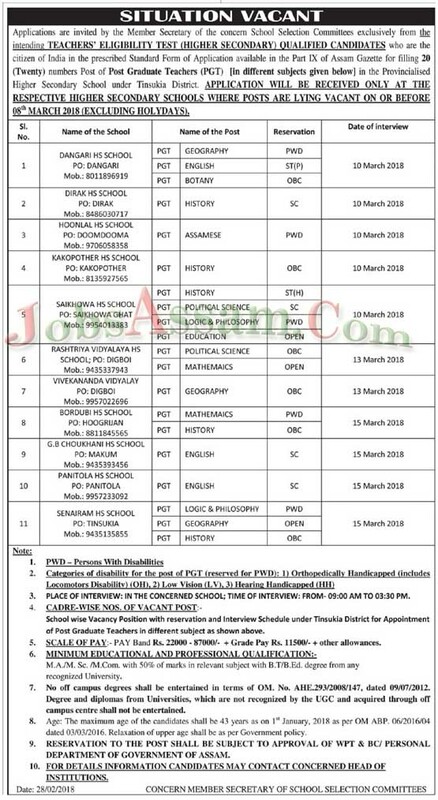 Applications are invited by the Member Secretary of the concern School Selection Committees exclusively from the intending TEACHERS' Eligibility Test (Higher Secondary) qualified candidates who are the citizen of India in the prescribed Standard Form of Application available in the Part IX of Assam Gazette for filling 20 (Twenty) numbers Post of Post Graduate Teachers (PGT) (In different subjects given below) in the Provincialised Higher Secondary School under Tinsukia District. EDUCATIONAL AND PROFESSIONAL QUALIFICATION:. M.A./M. Sc. /M.Com. with 50% of marks in relevant subject with B.T/B.Ed. degree from any recognized University. TIME OF INTERVIEW: FROM- 09:00 AM TO 03:30 PM. PAY: PAY Band Rs. 22000 - 87000/. Grade Pay Rs. 11500 + other allowances. Age: The maximum age of the candidates shall he 43 years as on 1st January, 20IR as per OM ARP. 06/201604 dated 03/03/2016. Relaxation of upper age shall be as per Government policy. How to apply: The Applications in Standard Form along with all the documents from HSLC Onwards must reach ONLY AT THE RESPECTIVE HIGHER SECONDARY SCHOOLS WHERE POSTS ARE LYING VACANT ON OR BEFORE 08th MARCH 2018 (EXCLUDING HOLIDAYS).